Hailing from central New Jersey, Rebecca Palmer is one of the area’s most sought-after educators and performers. She recently earned a Master of Music in Trumpet Performance at West Chester University where she studied with Dr. Jean-Christophe Dobrzelewski and Mr. Robert Skoniczin. Rebecca earned a Bachelor of Music Education degree from the Pennsylvania State University where she studied with Dr. Langston J. Fitzgerald III. 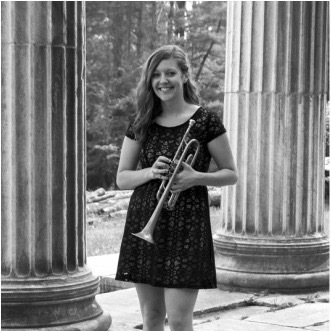 Rebecca was selected as a semifinalist to compete in the Graduate Solo Division of the 2016 National Trumpet Competition and has performed in master classes for trumpeters such as Scott Belck, David Bilger, Kevin Cobb, Luis González, Raymond Mase, and Joey Tartell. She has made appearances with groups such as the Liberty Wind Symphony and has most recently been awarded a Solo Cornet position in The Atlantic Brass Band, defending North American Brass Band Champions. In addition, Rebecca can be heard on Grammy-nominated and internationally acclaimed trumpet ensemble, Tromba Mundi’s, 2016 album entitled The Quest for Adventure. In October 2016, Rebecca toured Costa Rica with student and faculty brass quintets of West Chester University as part of the Festival Internacional de Música Barroca, Santa Ana. She also placed second in the Trumpet Division of the Susan Slaughter Solo Competition Preliminary Round at the 2017 International Women’s Brass Conference. She has twice traveled to the island of Aruba in July of 2016 and 2017 to perform as a soloist and chamber musician at the Aruba Symphony Festival. Rebecca is proud to have served two years as Assistant Conference Director for the International Trumpet Guild. She assisted in planning the 2016, 2017, and 2018 ITG conferences in Anaheim, California, Hershey, Pennsylvania, and San Antonio, Texas, respectively. In August 2017, Rebecca was appointed Director of Bands and Trumpet Specialist at Monroe Township Middle School in Monroe Township, New Jersey. She oversees all 7th and 8th grade instrumental ensembles including the Symphonic Band, Wind Ensemble, and Jazz Ensembles in addition to conducting trumpet lessons and sectionals in grades 7-12. She maintains a busy private teaching schedule throughout the greater Philadelphia and central New Jersey regions.